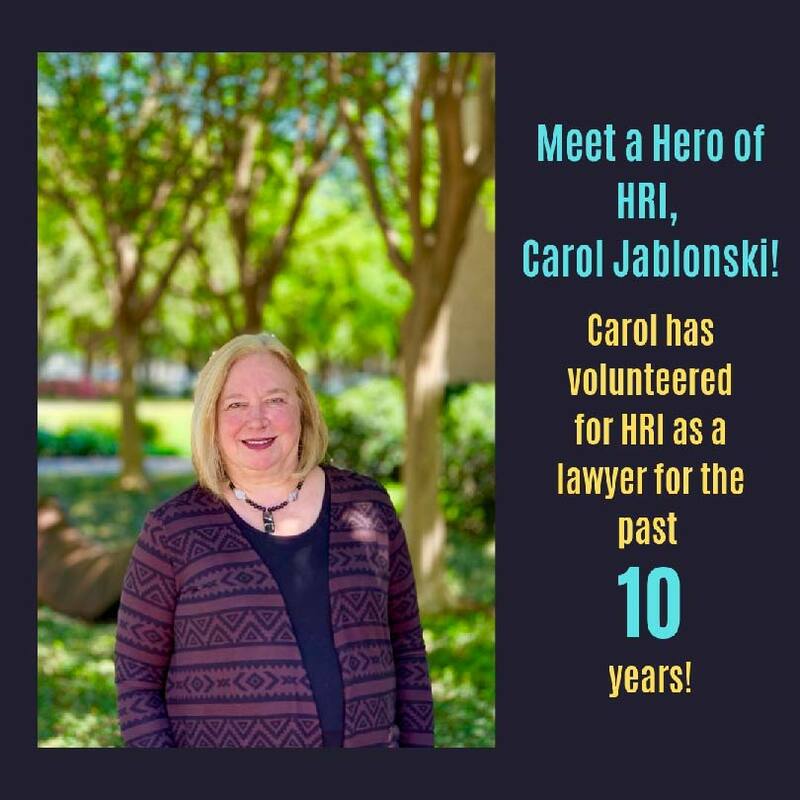 ﻿Meet a Hero of HRI, CAROL JABLONSKI! I came to HRI through a group called Executives in Action. The group paired non-profits with “executives” who filled a need for the non-profit. I came to HRI when it had taken on a large number of VAWA and U Visa cases because another non-profit (Safehaven in Ft. Worth) had lost funding to handle these cases. The original idea was for a person (who turned out to be me) to come in and help the non-profit handle these 23-30 cases. However, once I got here I stayed. The opportunity to truly change someone’s life by giving them the opportunity to build a life in the United States free from the violence in their home countries and abuse, neglect or abandonment in their families. It is amazing to see former clients blossom once they are safe and given the opportunity to live free from fear. The SIJS client who was subject to horrible gang violence in his home country who had emotionally shut down and couldn’t speak English is not in college studying computers and giving back by acting as a translator. The victim of domestic abuse who has prospered to the point where she is supporting her family and no longer qualifies for HRI’s free legal services when she is ready to become a U.S. citizen. Having a client with little to nothing bring in a cake, or tamales or flowers just to thank you and the HRI staff is worth more than words can describe. Believe me – it’s good for your soul. There are many ways to volunteer and each can be satisfying.